The eyeball is a bilateral and spherical organ, which houses the structures responsible for vision. It lies in a bony cavity within the facial skeleton – known as the bony orbit. Anatomically, the eyeball can be divided into three parts – the fibrous, vascular and inner layers. In this article, we shall consider the anatomy of the eyeball in detail, and its clinical correlations. The eyeball can be divided into the fibrous, vascular and inner layers. These layers have different structures and functions. We shall now look at these layers in further detail. The fibrous layer of the eye is the outermost layer. It consists of the sclera and cornea, which are continuous with each other. Their main functions are to provide shape to the eye and support the deeper structures. The sclera comprises the majority of the fibrous layer (approximately 85%). 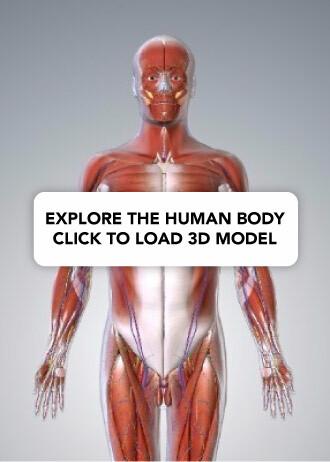 It provides attachment to the extraocular muscles – these muscles are responsible for the movement of the eye. It is visible as the white part of the eye. The cornea is transparent and positioned centrally at the front of the eye. Light entering the eye is refracted by the cornea. 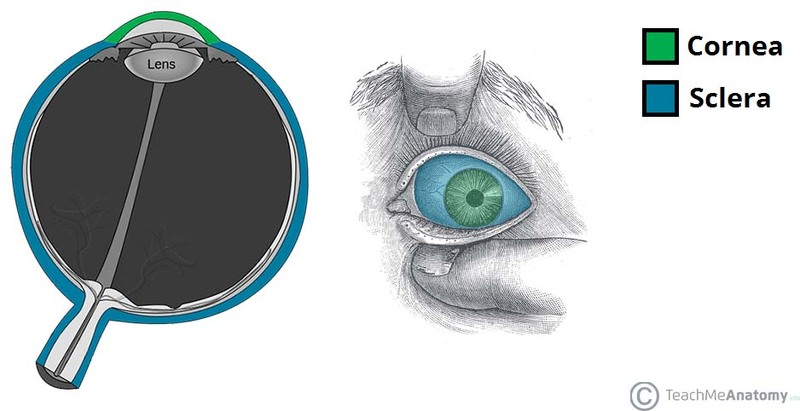 Fig 1.0 – The cornea and sclera of the eye. Choroid – layer of connective tissue and blood vessels. It provides nourishment to the outer layers of the retina. Iris – circular structure, with an aperture in the centre (the pupil). The diameter of the pupil is altered by smooth muscle fibres within the iris, which are innervated by the autonomic nervous system. It is situated between the lens and the cornea. Neural layer – the innermost layer of the retina. It consists of photoreceptors; the light detecting cells of the retina. It is located posteriorly and laterally in the eye. Pigmented layer – the outer layer of the retina. It is attached to the choroid layer and acts to support the neural layer. It continues around the whole inner surface of the eye. Anteriorly, the pigmented layer continues but the neural layer does not – this is part is known as the non-visual retina. Posteriorly and laterally, both layers of the retina are present. This is the optic part of the retina. The optic part of the retina can be viewed during ophthalmoscopy. The centre of the retina is marked by an area known as the macula. It is yellowish in colour, and highly pigmented. The macula contains a depression called the fovea, which has a high concentration of light detecting cells. It is the area responsible for high acuity vision. The area that the optic nerve enters the retina is known as the optic disc – it contains no light detecting cells. 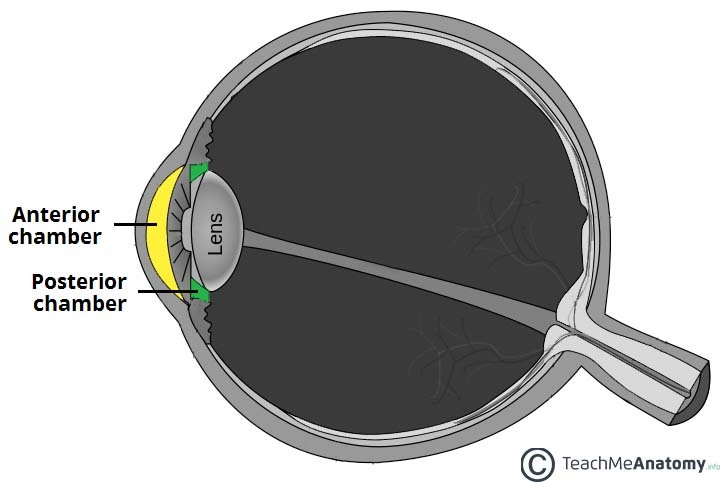 Fig 1.1 – The optic part of the retina. Within the eyeball, there are structures that are not located in the three layers. These are the lens and the chambers of the eye. The lens of the eye is located anteriorly, between the vitreous humor and the pupil. 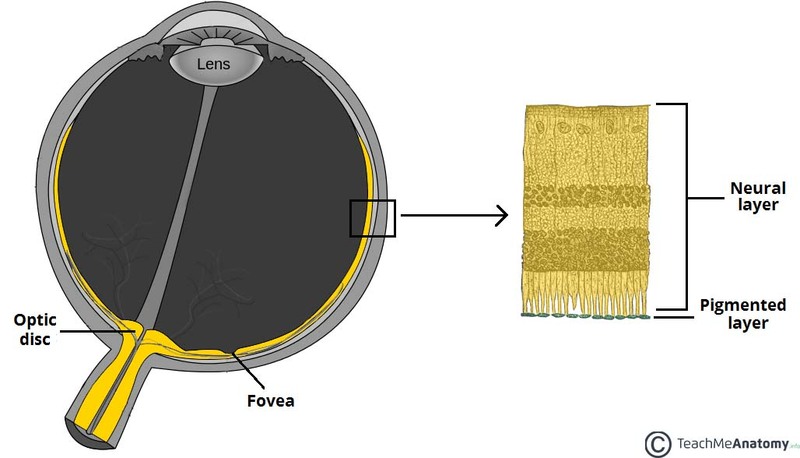 The shape of the lens is altered by the ciliary body, altering its refractive power. In old age, the lens can become opaque – a condition known as a cataract. There are two fluid filled areas in the eye – known as the anterior and posterior chambers. 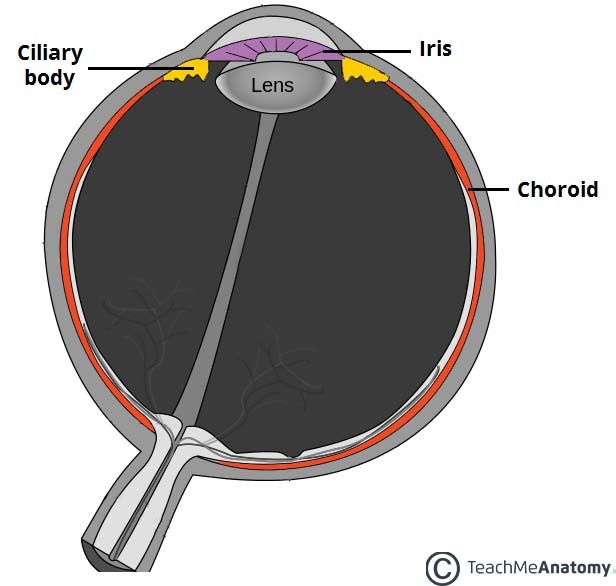 The anterior chamber is located between the cornea and the iris, and the posterior chamber between the iris and ciliary processes. The chambers are filled with aqueous humor – a clear plasma-like fluid that nourishes and protects the eye. The aqueous humor is produced constantly, and drains via the trabecular meshwork, an area of tissue at the base of the cornea, near the anterior chamber. If the drainage of aqueous humor is obstructed, a condition known as glaucoma can result. Fig 1.3 – Anterior and posterior chambers of the eye. The eyeball receives arterial blood primarily via the ophthalmic artery. This is a branch of the internal carotid artery, arising immediately distal to the cavernous sinus. The ophthalmic artery gives rise to many branches, which supply different components of the eye. The central artery of the retina is the most important branch – supplying the internal surface of the retina. Occlusion of this artery will quickly result in blindness. Venous drainage of the eyeball is carried out by the superior and inferior ophthalmic veins. These drain into the cavernous sinus, a dural venous sinus in close proximity to the eye. Open angle – where the outflow of aqueous humor through the trabecular meshwork is reduced. It causes a gradual reduction of the peripheral vision, until the end stages of the disease. Closed angle – where the iris is forced against the trabecular meshwork, preventing any drainage of aqueous humor. It is an ophthalmic emergency, which can rapidly lead to blindness. 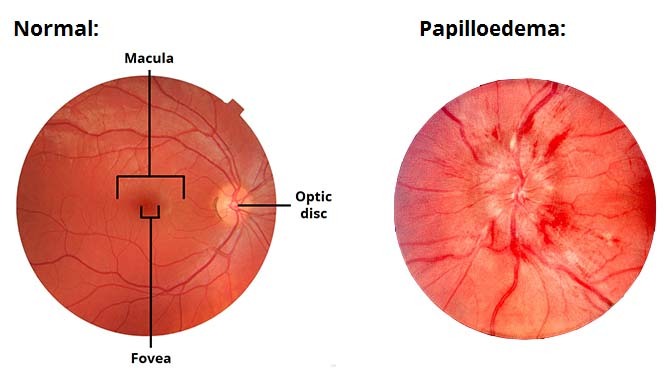 Papilloedema refers to swelling of the optic disc that occurs secondary to raised intracranial pressure. The optic disc is the area of the retina where the optic nerve enters and can be visualised using an ophthalmoscope. In papilloedema, the high pressure within the cranium resists venous return from the eye. This causes fluid to extravasate from blood vessels and collect in the retina, producing a swollen optic disc. Fig 1.4 – The fundus (interior surface) of the eye. What contributes the majority of the fibrous layer of the eyeball? Which structure forms the innermost layer of eye? Which substance fills the anterior and posterior chambers of the eye?